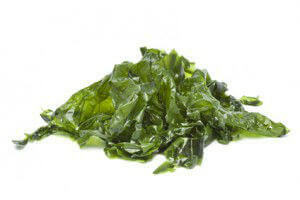 Considered one of the the healthiest foods on the planet, seaweed is a mainstay of the Asian diet. It has been eaten there for thousands of years. In 800 A.D. there were six types of seaweed used in Japanese cooking. Records indicate that Japanese people in 795 A.D. used seaweed to make nori. Nori is a type of seaweed that many people are familiar with. This is the thin wrapping used for sushi rolls. Nori strips can be toasted in the oven on low heat to make a great snack. Seaweed has been used as fodder and an herbal medicine during early Greek and Roman times. Red algae was used in the Mediterranean as a dying agent and as a medicine to treat parasitic worms. Farmers in Scotland and Ireland have been employing seaweed as mulch for the soil for hundreds of years. Ancient Hawaiian people grew kelp gardens and used over 60 species of seaweed for food, medicine and in religious ceremonies. Today we know that seaweed contains phytonutrients and antioxidants, including a number of alkaloids that offer powerful antioxidant properties. It is an antiviral, antimicrobial, antifungal and a powerful anti-inflammatory which can help slow the aging process and keep illness at bay. Seaweed is considered the most potent source of naturally occurring iodine on earth. Just one gram will meet your daily iodine needs. This micronutrient is one of the hardest to come by, which is why it is added to “iodized” table salt. Iodine helps boost thyroid and brain health. Many people lack adequate iodine in their diets – yet it is crucial to proper thyroid function. Brown algae, including the most commonly eaten seaweeds like wakame, kelp and arame, accumulate iodine in up to 30,000 times more concentrated form than sea water. Some of the longest living people on earth, the Okinawans, are known to have low cholesterol levels and unclogged arteries as well as low homocysteine levels, which is a heart-damaging chemical. It’s no coincidence that seaweed is a big part of their diet. Author and alternative medicine television personality Chris Kilham, best known as the Medicine Hunter, recently discussed how adding seaweed to your diet can be a great way to boost weight loss. One of the reasons seaweed is so good for weight loss, Kilham states, is that not only is it low in calories, but the act of chewing and digesting it likely burns more calories than what you’re taking in – ultimately you’ll end up with a calorie deficit when consuming seaweed. Seaweed will also help you stay satisfied and full longer, preventing overeating and cravings for unhealthy snacks. A 2010 study confirms another one of Kilham’s findings; eating seaweed may reduce the rate of fat absorption by 75 percent due to its inhibitory effect on a digestive enzyme known as lipase. This surpasses the ability of most anti-obesity treatments available on store shelves. Interestingly enough, the rate of prostate cancer is very low in Asian countries where this sea lettuce is consumed regularly. According to the National Cancer Institute, over 230,000 new cases of prostate cancer will be diagnosed this year and almost 30,000 men will die from this cancer in the United States. Study leaders also say that sea lettuce is a healthy natural supplement that can not only help prevent prostate cancer but also reduce inflammation, preventing disorders such as arthritis and heart disease. Hey Buddy!, I found this information for you: "Sea Lettuce Found off Florida Coast Prevents Cancer". Here is the website link: https://www.thealternativedaily.com/sea-lettuce-found-off-florida-coast-prevents-cancer/. Thank you.